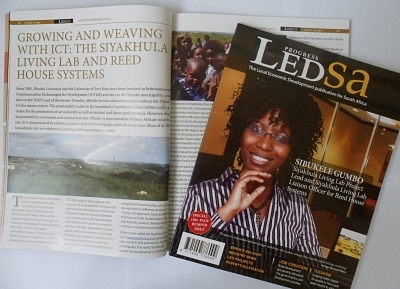 Look out for the recently released LED Progress South Africa 2011 publication which features the Siyakhula Living Lab as its 4-page front cover story! This 100+ page bi-annual LED SA bumper edition looks into the impact of ICT on poverty alleviation in rural areas, in the form of new ICT applications appropriate for rural areas. SLL is appropriately prominantly featured as it addresses the skills development problem by bringing ICTs for economic sustainability and contributing to the improvement in education. Contact us if you are interested in one of our limited hard copies of the publication. We hope to provide a link or a soft copy of the article in near future.